Looking west into the Gorge from Mitchell Point. If you find yourself overwhelmed by the crowds at Angels Rest, Mitchell Point in the east end of the Gorge is terrific alternative that offers equally stunning views, without the circus atmosphere. 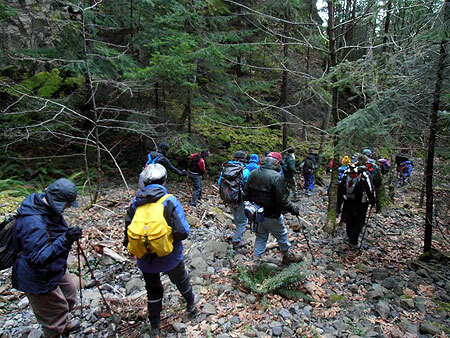 Though the hike is just 2.6 miles round-trip, the elevation gain is around 1,000 vertical feet, thanks to an often steep path. 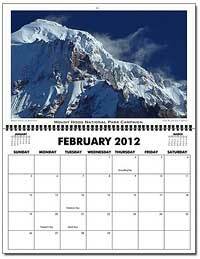 But the unfolding scenery will distract you from the huffing and puffing required to reach the summit. 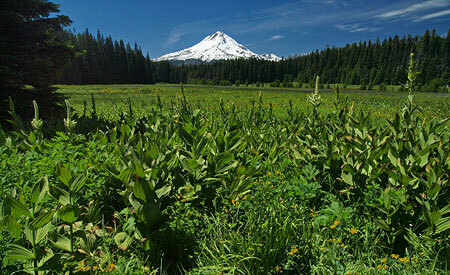 Be sure to pick a sunny day for this hike, and if you make the trip from late April through early June, you’ll also be rewarded with a variety of wildflowers along the way. 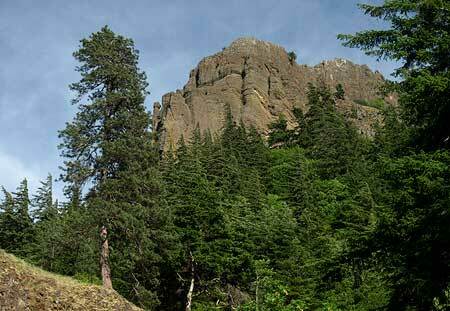 Mitchell Point is unmistakable to travelers rushing by on I-84, rising dramatically from the forested Gorge slopes, just west of Hood River. 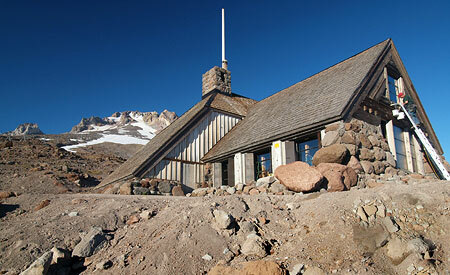 The main summit is a dizzying rocky spine towering 1,000 feet above the Columbia River and I-84. Below the main summit is Mitchell Spur, a tilted, ramp-shaped peak with a sheer cliff that rises nearly 400 feet above the highway. The Native American names for these prominent outcrops were Storm King (Mitchell Point) and Little Storm King (Mitchell Spur). 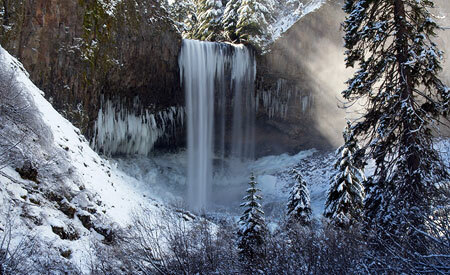 The current name reportedly comes from an early trapper who lived in the area. Mitchell Point from the west. Like most of the rocky outcrops that frame the Columbia Gorge, Mitchell Point is composed of flood basalts — layers of dense lava spread over the region in the very distant geologic past. 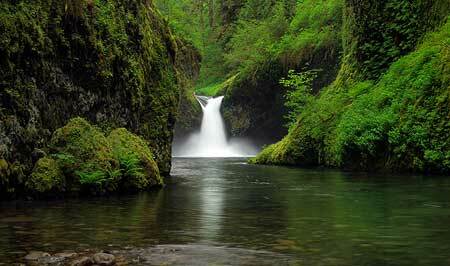 In this part of the Gorge, earth movements have tilted these ancient flows to the south at 30-degree angle. This tilt is most evident in Mitchell Spur, where exposed cliffs reveal the many layers of basalt that shape the terrain. 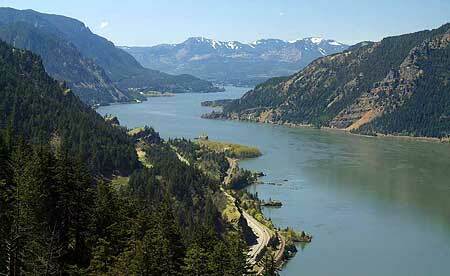 But it took the ice age Missoula Floods to shape Mitchell Point as we now know it. 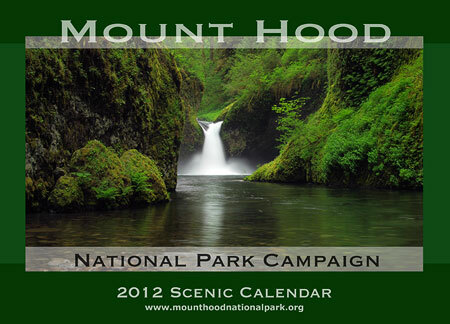 These monumental floods repeatedly swept through the Gorge 13,000 years ago at depths of up to 600 feet deep and speeds up to 80 mph. 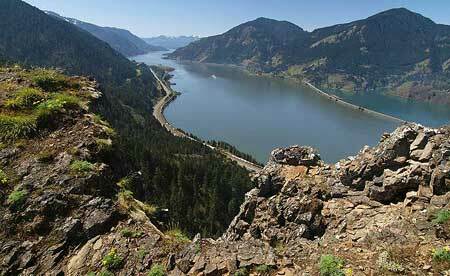 The ancient floods stripped away loose material from the walls of the Columbia Gorge, exposing the familiar rocky crags we now know as Crown Point, Rooster Rock, Beacon Rock and Mitchell Point. The tilt of the underlying basalt at Mitchell Point has allowed the steep north face of the rock to maintain its near-vertical pitch, millennia after the floods subsided. 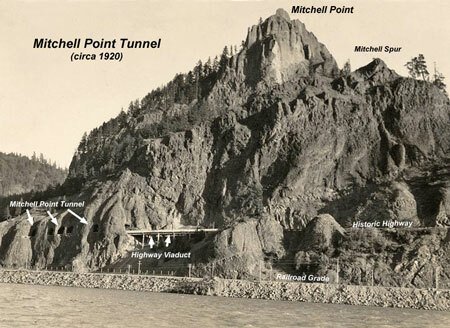 Mitchell Point from the Washington Side in the 1920s, showing the river-level railroad grade, old highway viaduct and famous Mitchell Point Tunnel. When the railroads were built through the Gorge in the late 1800s, they hugged the cliffs in places like Mitchell Point, where rocky bluffs jutted into the river. 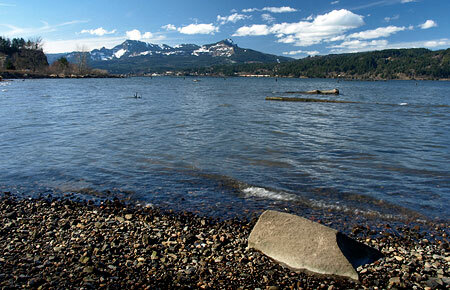 This meant that Samuel Lancaster, the visionary engineer of the historic Columbia River Highway, was left with little space for his iconic road when construction began in 1914. In these spots, Lancaster applied daring creativity by engineering his road onto the steep walls of the gorge, high above the river. At Mitchell Point, his remarkable design traced the side of Mitchell Spur, carved into the basalt face 100 feet above the railroad in 1915. 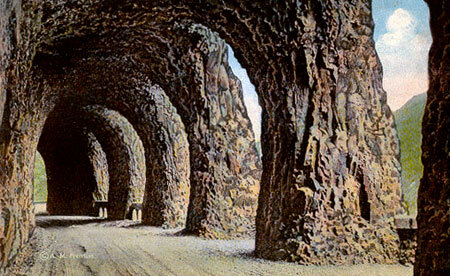 Near the east end, he famously designed a 385-foot tunnel with windows carved into solid rock. The five windows of Mitchell Point Tunnel from the east approach. There were a total of five arched windows carved into the Mitchell Point Tunnel, each forming a roadside alcove. 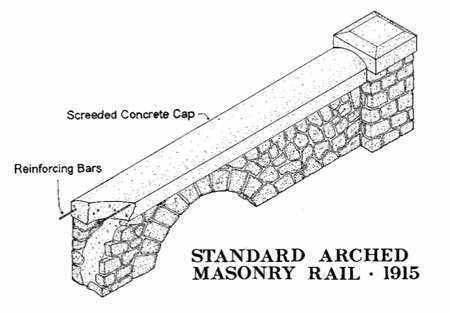 Each alcove was fitted with the standard arched masonry rail found throughout the gorge, constructed of basalt with a concrete cap. These stone walls had the practical function of keeping early visitors (and their automobiles) from slipping through the open windows, and onto the railroad tracks far below, but also added an aesthetic finishing detail that is typical of Samuel Lancaster’s designs. Equally amazing was the approach to the Mitchell Point Tunnel — a viaduct (pictured below) anchored to the vertical walls of Mitchell Spur led directly into the west portal of the tunnel. 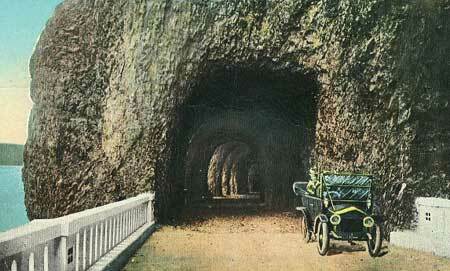 For early visitors in touring cars, it was truly a thrilling ride, and a dramatic gateway to the famous tunnel. The tunnel was destroyed in 1966 when modern-day I-84 was built, though much of the ledge that once held the old highway can still be seen today. 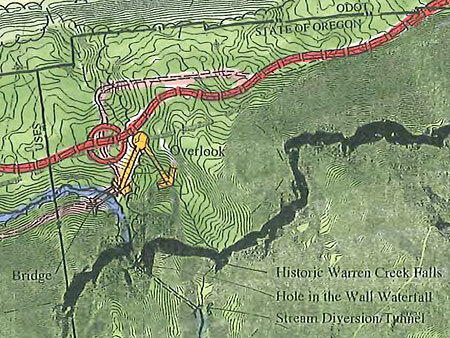 New plans call for re-creating at least a portion of the tunnel as part of completing the Historic Columbia River Highway trail. West end of Mitchell Point Tunnel in 1916. As you explore the Mitchell Point area, be sure to stop by the Anna and Vinzenz Lausmann memorial near the trailhead. 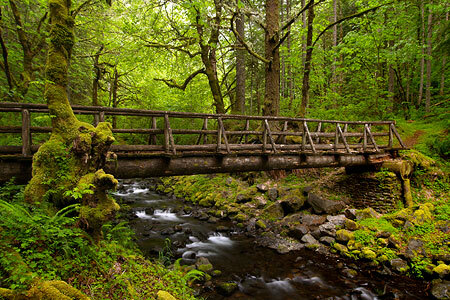 There, you can thank the Lausmann family for their generous donation of the surrounding land to the State of Oregon for “park purposes [to] further the recreational and scenic aspects of the Columbia River Gorge” on December 28, 1954. 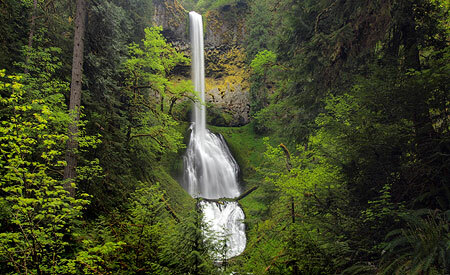 The area to the west of the trailhead falls within Wygant State Park, and was also a gift to the public, donated by Simeon and Olivia Reed in 1933. Seneca Fouts donated the land to the east in 1944, encompassing the top of Mitchell Point, and the area now carries his name as Seneca Fouts State Natural Area. The Lausmann donation completed the puzzle in 1954, preserving the entirety of Mitchell Point forever. The trail to Mitchell Point is unmarked and a bit obscure, at first. 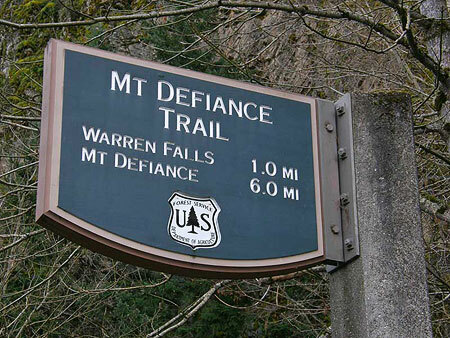 Simply head toward the state park signboard at the south end of the parking area and follow a paved trail a short distance before veering left and uphill onto an obvious unpaved path. The rustic route meanders through open forest for a few hundred yards, then begins climbing an occasionally steep series of switchbacks. Look closely, and you’ll note the trail briefly follows the original 1870s wagon road through the Gorge, a primitive road that traversed between Mitchell Point and Mitchell Spur. The trailhead, with Mitchell Point rising above. After climbing a few switchbacks through young forest, you’ll notice a trail heading off to the north at the final switchback, at about 0.4 miles. If you have the time and are looking for a little adventure, this path heads off to Mitchell Spur. 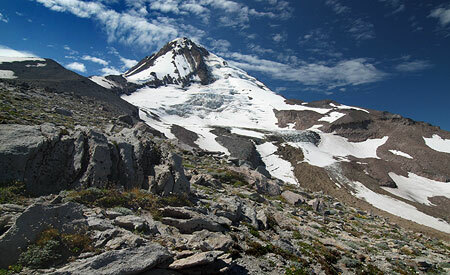 The first section is an obvious trail to the saddle between Mitchell Spur and Mitchell Point, and from there it’s a cross country through a steep meadow to the obvious summit. Looking up at Mitchell Point from the lower trail. The main route continues past the spur trail and soon enters a broad talus field, traversing steeply across the loose rock. You’ll have your first views of the Columbia River from here — a tantalizing preview of the views ahead, and just enough to make up for the steep climb. The trail briefly enters forest, then heads back across the talus slope to a switchback before traversing back and re-entering dense forest. You’ll have a good view of the summit ridge through the trees, and can admire the hundreds of tiny calypso orchids that bloom along this shady section of trail in late April and early May. The rocky spine of Mitchell Point from the upper trail. Soon the trail passes through a final stand of large douglas fir before emerging in an open powerline corridor. 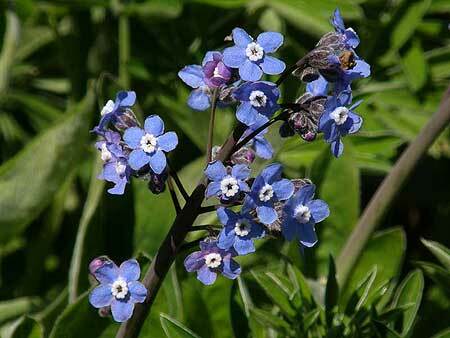 Though not the most aesthetic setting for a trail, the corridor does offer a profusion of wildflowers in spring, including impressive clumps of a striking blue flower called great hounds tongue. Great hounds tongue blooms in late April and early May near the crest of Mitchell Point. The trail makes another quick switchback in the powerline corridor, then reaches an open saddle directly below Mitchell Point, at 1.1 miles. 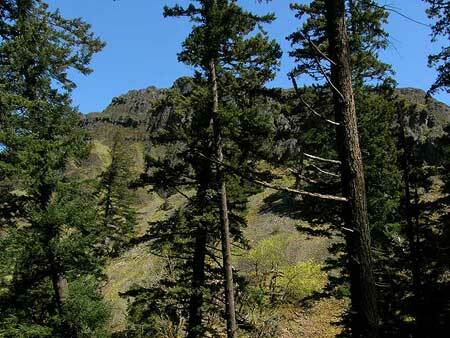 From here, the summit is framed in gnarled Oregon white oak. 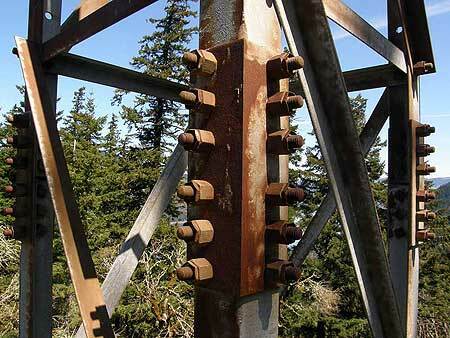 Even the transmission towers are interesting, as they offer a glimpse into the 1930s construction heyday when so much of Oregon’s infrastructure was built through New Deal programs that eased the Great Depression. Built to last: Depression-era transmission towers were installed when Bonneville Dam was constructed in the 1930s. From the saddle, the final 0.2 mile stretch to the summit of Mitchell Point heads off to the north. 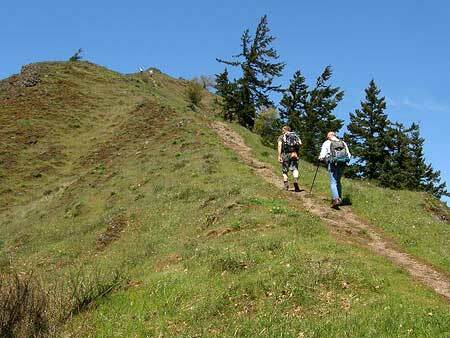 The trail is steep and slick in spots, but you won’t mind, because the unfolding scenery is breathtaking. The west face of Mitchell Point drops off in a harrowing series of cliffs, while the east face is a steep hanging meadow. The summit path follows the narrow ridgeline between these slopes. The trail ends just short of the true summit, but don’t attempt to go further — the exposure is extreme, and the view isn’t any better. 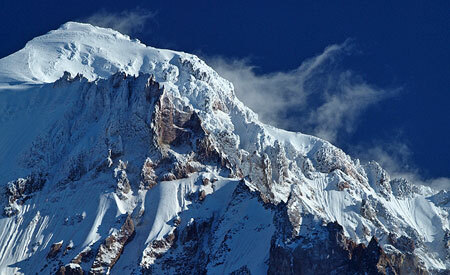 Instead, pick one of any number of perches along the summit ridge to relax and enjoy the view. The final pitch to the summit of Mitchell Point. 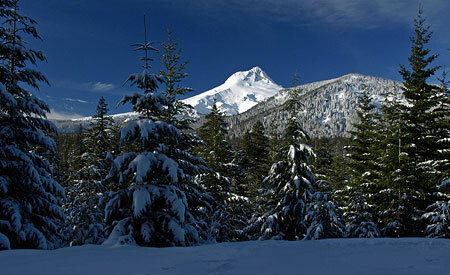 The vista to the west extends to Stevenson Washington, and the Table Mountain-Greenleaf Peak complex, beyond. 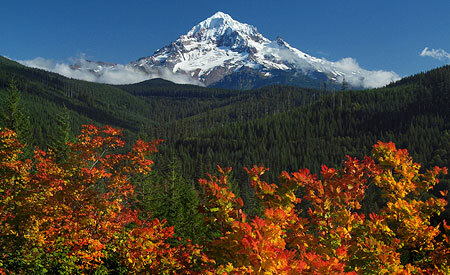 To the east, the view reaches toward the grassy highlands of Burdoin Mountain, above White Salmon, Washington. 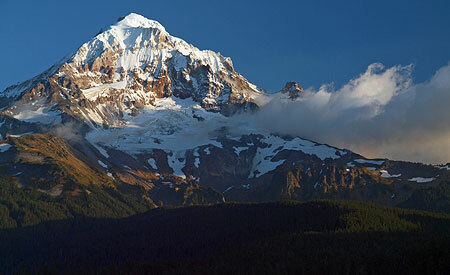 The summit of Mount Defiance rises high above the forests to the southwest. Far below, you can watch tiny trucks and cars inching along on I-84, and an occasional freight train passing along both shores of the Columbia, looking like model train sets. Barges loaded with Eastern Oregon grain also look like toys from this lofty perspective. Tiny trucks, trains and barges move through the Gorge in this view from the summit of Mitchell Point. Depending on the season and weather, you might get buzzed by dive-bombing cliff swallows while taking in the summit view. Though vertigo-inducing, it’s fascinating to peer over the edge of the sheer summit and watch these aerial acrobats streak through air to their nests in the cliffs below. 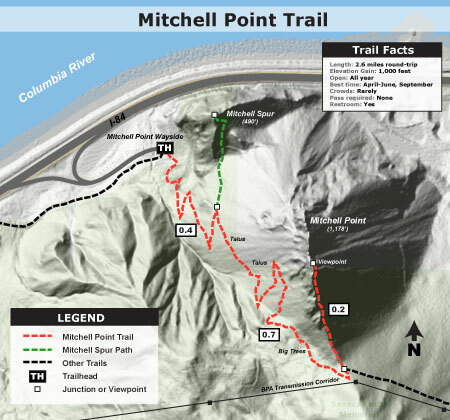 For all its scenery, Mitchell Point is a steep climb with plenty of exposure in the final stretch, so best to leave small kids at home, and keep dogs on a leash. 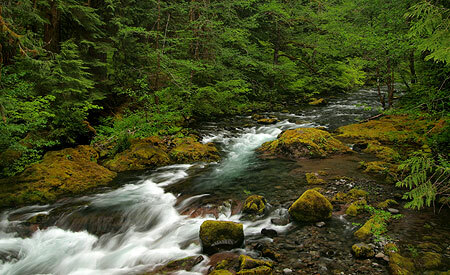 As with any eastern Gorge hike, learn to identify (and avoid) poison oak, and check for ticks after your hike. To visit Mitchell Point, print the large version of the trail map (above) as a pocket reference, then head east from Portland on I-84 to Exit 58, which takes you to Lausmann State Park and the Mitchell Point trailhead. The finest accommodations can be found at Lausmann State Park. 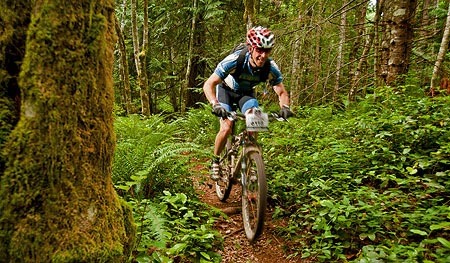 No pass is required at this trailhead. 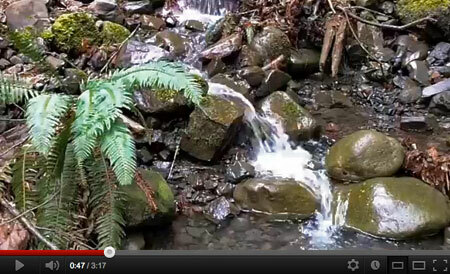 Carry water, as no reliable sources are available. 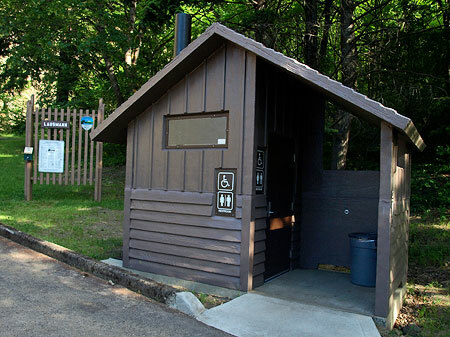 A toilet is provided at the trailhead. To return to Portland, you’ll have to head further east on I-84 to the next interchange, at Hood River to reach westbound I-84). Though this message was posted on the Seneca Fouts State Natural Area page and not on the Vincenz Lausmann State Park page, it’s safe to assume the reference is to the same parking area. If you should find the gate closed and don’t want to wait until October, there is plenty of space for parking off the entrance road, and near I-84, and it’s a short walk from there to the trailhead. Thanks for the heads-up, Chris! Mostly lost in the noise of Interstate-84, the tiny Tunnel Point Wayside is a forgotten bit of ground that deserves a little more respect. This spot is named for the railroad tunnel that cuts through the lower buttress of Chanticleer Point, to the south. 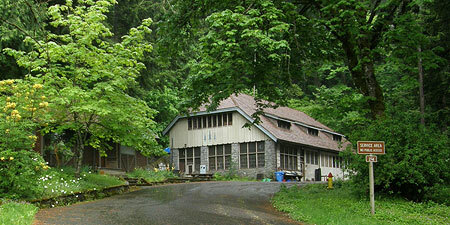 In the early days of Highway 30 construction in the Gorge, the wayside at Tunnel Point was designed as a scenic turnout for visitors. 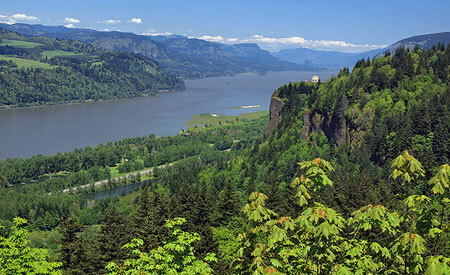 From here, the first big view of the Gorge spreads out, with Crown Point and Vista House framing the scene. Today, freeway barricades prohibit access to the wayside for eastbound travelers entering the Gorge, and the turnout is an afterthought for most westbound travelers, since the Gorge view is behind them. The wayside has thus devolved into a huge, paved layover spot for semi-trucks — a sad epitaph for what should (and could) be a premier gateway viewpoint in the Gorge. Tunnel Point has two U.S.G.S. benchmarks and a ship beacon bolted to its tiny, rocky cape. 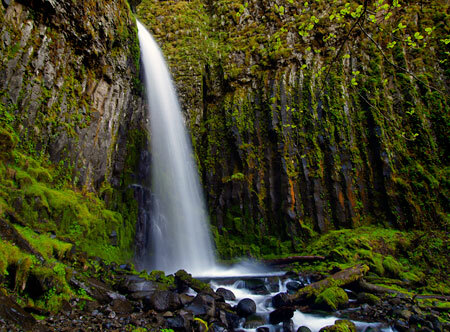 Beyond the sterile steel guardrail that borders the turnout, basalt cliffs drop 20 feet into the river. These little cliffs are likely remnants of a more noble formation, undoubtedly quarried to help build the modern highway in the Gorge in the 1940s and 50s. But they still give a sense of the natural environment that once existed here, and provide for an interesting shoreline along the river. This USGS benchmark was placed in 1956, likely in conjunction with modern highway construction in the Gorge. Look closely at these rocky mini-bluffs and you’ll see cliff-dwelling Gorge plants making a home, while red alder and Douglas fir are colonizing the rocky shoreline on both sides of Tunnel Point. 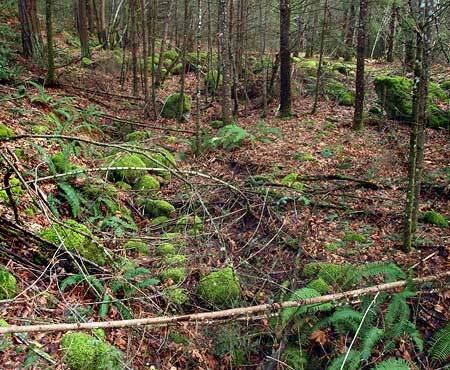 Nature is making a valiant attempt to restore this spot, even if we humans are lagging in the effort. 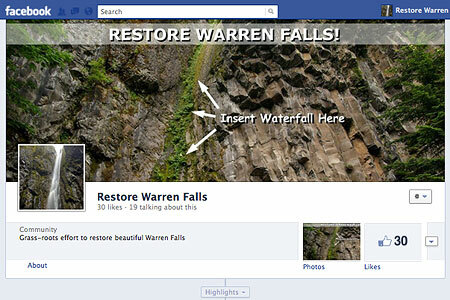 How could the Tunnel Point Wayside be restored? For starters, the massive expanse of asphalt could be redesigned to restore green areas, with landscaping, trees, picnic tables, restrooms and perhaps a travel information center. 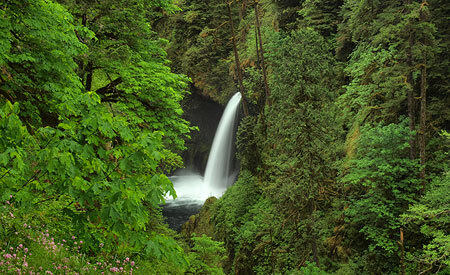 After all, this spot is as much a gateway to the Portland metropolitan area as to the Gorge, given that access is limited to westbound travelers. 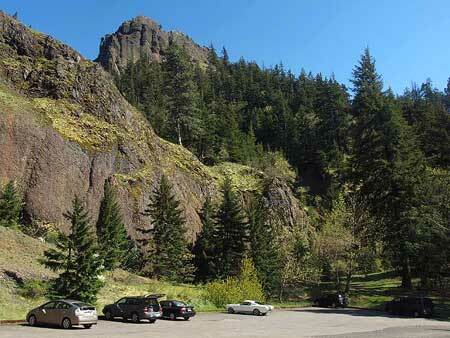 Next, a series of walking paths could be added along the little bluffs, providing a place for travelers to stretch their legs, and learn a bit about the Gorge. A wooden Oregon History sign is already mounted in the parking area, and could be restored to become part of an improved interpretive display and walking path system. Wasted space: the vast, barren turnout at Tunnel Point. These improvements would provide for a welcome refuge for travelers arriving in the Portland region from points east, but what about travelers entering the Gorge from the west? Providing access to eastbound visitors would be a tall order, requiring some sort of overpass or tunnel to deliver visitors from the opposite side of the highway. The cost, logistics and visual impacts probably make this infeasible, unfortunately. But for now, improving the wayside for westbound traffic would be a big step in the right direction. Since the wayside is within the highway right-of-way, improvements could be built by the Oregon Department of Transportation (ODOT) with highway funds, in conjunction with Oregon Parks and Recreation. Tunnel Point Wayside deserves this new lease on life, and travelers in the Gorge deserve to enjoy this unique perspective of the river and Gorge. Postscript: after writing this article a few months ago, I ran across a “generic” roadside pullout design in the 2005 I-84 Design Strategy — a joint ODOT, U.S. Forest Service, Federal Highway Administration and Columbia Gorge Commission planning document that lays out the framework for future improvements to the highway within the Columbia River Gorge National Scenic Area. 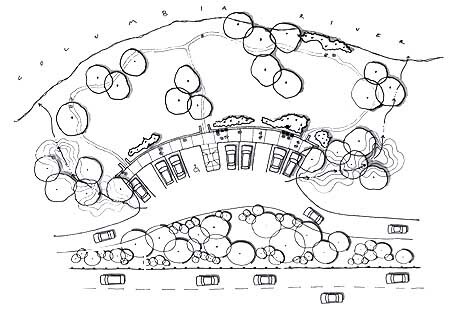 The schematic looks tailor-made for the Tunnel Point Wayside, and in this design, reclaims much of the parking area as a park with riverside loop trail. Though hard to see in this scaled-down version, the plan calls for just ten parking spots, with trucks obviously barred from entering (the truck stops in Troutdale are only a few miles further, after all). Most interesting are bio-swales on both sides of the pullout, draining the parking area and adding more green screening from the highway. A glimpse of what might be, perhaps?